Depression is deeply rooted in human behavior. The development of new antidepressants demands the creation of animal models to investigate new drugs, which potentially could work as antidepressants. The aim of this review is to discuss the different ways of assessing depression in clinical research, including clinical trials, and the different animal behavioral tests used to study depression and test the efficacy of antidepressants in pre-clinical studies. In clinical practice, a categorical classification, such as the Diagnostic and Statistical Manual of Mental Disorders (DSM) and the International Statistical Classification of Diseases and Related Health Problems (ICD) can be used for diagnosis, through the use of structured and semi-structured interviews. On the other hand, depression can also be assessed using a dimensional approach, through self- or clinicianrated questionnaires. Regarding the assessment of the efficacy of antidepressants in animal models, several tests are routinely used, namely the Forced Swim Test, the Modified Forced Swim Test, the Tail Suspension Test and the Sucrose Preference Test. These tests are informative, providing that the following rules are taken into account: 1) more than one test is used, with coherent results; 2) secondary drug effects, the most frequent being putative changes in motor activity, are taken into account and properly controlled with specific tests run concomitantly; 3) each test and specific protocol is validated with data from at least a gold standard antidepressant drug. We herein briefly discuss the potential and limitations of each of those tests. Keywords: Depression assessment, Antidepressants, Animal models, Screening tests, Behavioral pharmacology, Forced swim test, Tail suspension test, Sucrose preference test. Keywords:Depression assessment, Antidepressants, Animal models, Screening tests, Behavioral pharmacology, Forced swim test, Tail suspension test, Sucrose preference test. Abstract:Depression is deeply rooted in human behavior. The development of new antidepressants demands the creation of animal models to investigate new drugs, which potentially could work as antidepressants. 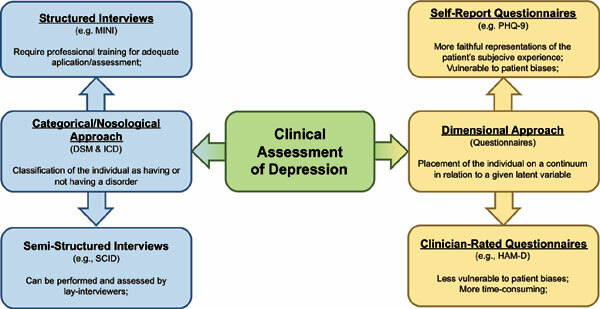 The aim of this review is to discuss the different ways of assessing depression in clinical research, including clinical trials, and the different animal behavioral tests used to study depression and test the efficacy of antidepressants in pre-clinical studies.